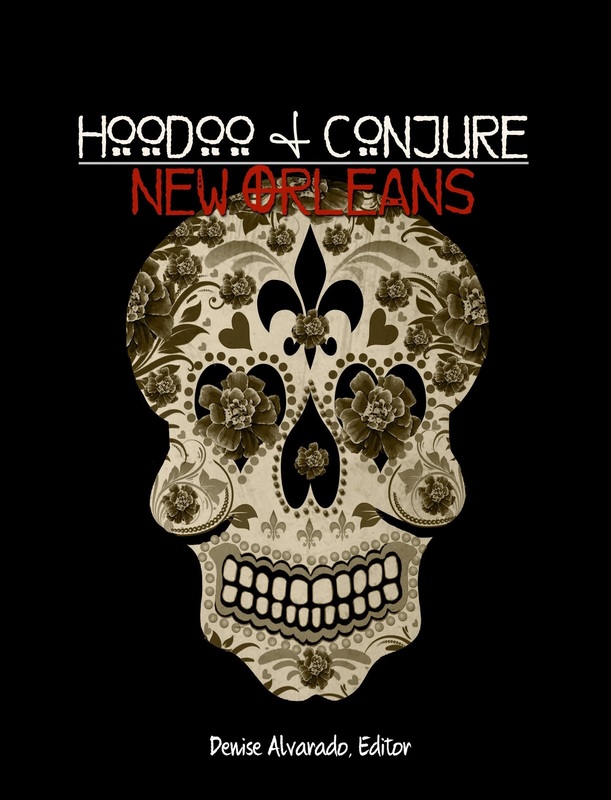 Hoodoo Almanac: Friday the 13th: Myth, Superstition, or Reality? Friday the 13th: Myth, Superstition, or Reality? One of my earliest memories about Friday the 13th as a day other than what is commonly portrayed in the media was when we were in Germany at an army base where my father was stationed. I remember it well; it was a sunny day and I was sitting on the grass outside. A soldier whom I did not know walked by me, looked at me and said “Happy Red Day.” I remember thinking to myself...what is he talking about? And then I remembered it was Friday the Thirteenth, and it must be something about this day that he is referring to. But why did he say that to me? I still don’t know the answer to that question; but, what we did find out was that he was the resident Satanist who was on a mission to infiltrate my life at the ripe young age of, oh yeah, did I mention...13? Apparently, there is no definitive date for the origin of the dreaded day of special misfortune. While there is evidence to suggest that the number thirteen was considered unlucky prior to the 20th century, there is no definitive link between Friday and the number 13, or so “they” say. I used to take that at face value, but not so much anymore. Actually, when you consider all of the origin stories, there are all kinds of connections between Fridays and thirteens. There are some who insist that Friday the 13th is a modern conceptual invention. According to this theory, the first recorded mention of a Friday the 13th occurred in 1907 with the publication of Thomas W. Lawson's popular novel, Friday, the Thirteenth. The storyline of the book tells of a stockbroker who exploits the superstition to create a panic on Wall Street on Friday the 13th. Obviously, it doesn’t make sense that this book is the first mention of Friday the 13th because the author had to draw from earlier superstitious beliefs about Friday the 13th to propel the plot of the novel. In my mind then, this origin story is crossed off the list. So, what’s the deal then? Well, another theory is proposed by Donald Dossey, founder of the Stress Management Center and Phobia Institute in Asheville, North Carolina. According to Dossey, who is also a folklore historian, the phobia associated with Friday the 13th is the result of an ancient combination of two separate negative associations with the number 13 and the day Friday. Okay, so if something bad happens on a Friday, and it happens to be the 13th, then...that make Friday the 13th a day for bad luck? Well, considering bad things have happened to people on every other day of the week and on every other date as well, there’s got to be more to it than that. But, I do understand the psychology behind this explanation. Some suggest Friday has always been considered to be an unlucky day. For example, there is the reference made by Chaucer in his 14th-century book The Canterbury Tales, where he states Friday is considered a day of misfortune and ill luck: “...and on a Friday fell all this mischance.” Another explanation is based on the Christian belief that Jesus was crucified on a Friday. I can certainly agree this was a bad day for Jesus. But wait, there’s more! We can’t overlook Wall Street’s perpetuation of the superstition for decades. On Oct. 13, 1989, Wall Street experienced what was at the time the second largest drop in the Dow Jones Industrial Average in history. As a result, the day was nicknamed the Friday-the-13th mini-crash. And finally, we can’t let Hollywood off the hook. “Fridays will never be the same again” was the tagline to Paramount Pictures 1980 release of Friday the 13th, starring Jason, every horror movie buff’s favorite slasher. Born on Friday the 13th, Jason chooses to make that day even more meaningful by seeking revenge on folks who are similar in behavior and appearance to those who allowed him to drown in Crystal Lake. But long before the Friday the 13th mini-crash of 1989, Lawson’s 1905 novel Friday the Thirteenth, and Jason, for that matter, we find peculiar associations with the number 13. For example, it is curiously omitted in the list of laws in ancient Babylon's (circa 1772 BC) Code of Hammurabi. No one seems to know what the reason was for the omission. And, there is an age-old myth that if 13 people dine together, one will die within a year. The myth is said to derive from both the Last Supper when Jesus dined with the 12 Apostles prior to his death and a prevalent Norse myth. Okay, so let’s blame it on the trickster. Apparently, twelve gods were having a dinner party at Valhalla, the majestic Norse hall presided over by Odin and where half of those who die in battle go to upon death. An uninvited 13th guest arrived, the mischievous Loki. Ever the trickster, Loki manipulated Hoder, the blind god of darkness, to shoot the god of joy and gladness, Balder the Beautiful, with a mistletoe-tipped arrow. After Hoder shot Balder, the whole earth grew dark. Balder died and all of Earth mourned. It was an awfully unlucky day. Since then, the number 13 has been considered ominous and foreboding. Loki could be the end of it, but just for shits and giggles let’s take a look at a theory made famous through the DaVinci Code. In the book, a connection is drawn between the slaughtering of the Knights Templar by the Church and Friday the 13th. The Knights Templar were the wealthy, powerful and legendary order of warrior monks formed during the Christian Crusades. Historically, the arrest of Jacques de Molay, the Grand Master of the Knights Templar, did occur on Friday, Oct. 13, 1307. The event marked their demise by the Church and state for fictitious crimes such as heresy, blasphemy, various obscenities, and homosexual practices. Hundreds of members of the Order died excruciating deaths by torture and burning at the stake. Friday the 13th was indeed an unlucky day for the Knight’s Templar. Obviously, it is impossible to determine the exact origin of the superstition surrounding Friday the 13th. That said, there are innumerable superstitions related to this day and date that warrant mentioning simply because people observe them—a LOT of them—and they aren't going away any time soon. But what about good luck? Is there anything lucky about the number 13? Is There Such a Thing as Lucky 13? The teachings of Jesus are centered on the formula of 12 + 1 (Jesus plus his 12 disciples). According to Pythagoras, one added to 12 creates the unlimited number of 13. It is this formula that allows miracles such as the multiplication of fish and loaves. Thirteen is the number of the Great Goddess, represented by 13 lunar cycles to a year. Contemporary witches consider thirteen to be a lucky number. In the Kabbalistic system, numbers are equated with letters, and the number 13 is equated with love and unity since the Hebrew letters for love and unity both equal 13. Thirteen is the cosmic law of destiny: death through failure and regeneration. And hey, let's don't forget the Baker's Dozen...Okay, so that's not esoteric, but it is a good thing, right? I mean, who doesn't like an extra donut? Clearly, there are many explanations for the association between Friday and the number 13; yet, none of them adequately answer the question regarding the absolute origin of the superstition. We’ve looked at origin stories and superstitions and beliefs, both bad and good. Its prevalence is undeniable. However, the whole topic warrants another question. Is there anything to it? Indeed, inquiring minds want to know. Friday the 13th has been the subject of formal research. One way to measure whether or not an actual phenomenon exists is to analyze statistical data related to the prevalence of traffic accidents and hospital admissions that occur on Friday the 13th as compared to other days of the week. 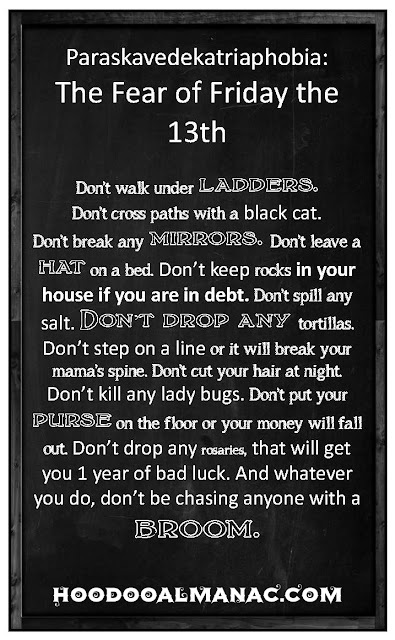 According to research completed at the Dutch Centre for Insurance Statistics in 2008, there were fewer accidents and reports of theft or fire on Friday the 13th than on other Fridays. One of the few reputable research papers on the matter - published in the British Medical Journal in 1993 - found that there was a higher risk of road accidents on Friday the 13th than on other Fridays. It found the risk of hospital admission as a result of a transport accident may be increased by as much as 52 percent on Friday the 13th, compared to Friday the 6th. Another study on the topic, conducted by Professor Simo Nayha from Finland's University of Oulu in 2004, found women, in particular, were at higher risk of dying in a road accident on Friday the 13th, compared with other Fridays. And he offered this conclusion: "Friday the 13th may be a dangerous day for women, largely because of anxiety from superstition. Whatever—don’t get me started on the female focus of the latter research which is annoyingly reminiscent of the 19th-century-no-longer-recognized medical diagnosis of female hysteria. The problem with conducting research on Friday the 13th, aside from possible gender bias, is that it is impossible to control specific variables. For example, some people take extra caution when doing anything that day, whether they are driving or taking a shower. Still, others simply avoid going out altogether. Surely these conditions would affect the outcome of any research regarding the incidence of accidents on Friday the 13th. Friday the 13th always occurs at least once a year in the Gregorian calendar and can appear up to three times in any one year. In 2017, there are two incidences of the dreaded day: January 13, and October 13. So, is there anything that can be done to prevent possible bad luck for believers? Fortunately for paraskevidekatriaphobics, a number of remedies exist. You can escape to high ground, stand on your head and eat a piece of gristle (yum!) or burn all of your socks with holes in them for protection from inevitable. 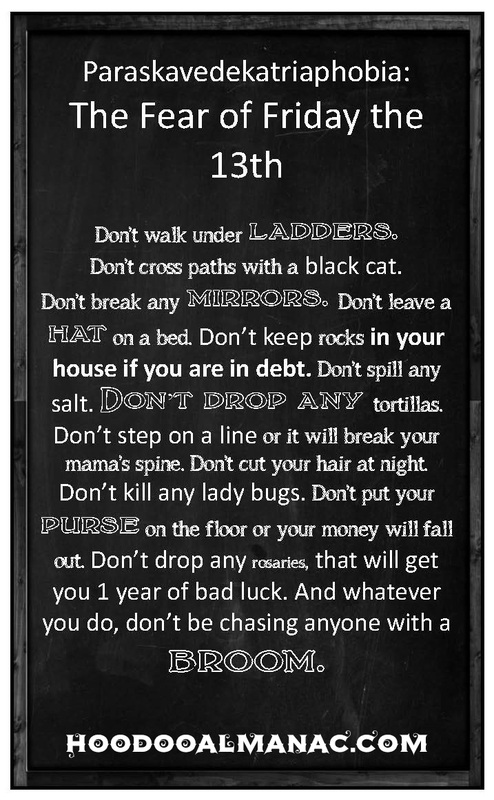 Or, you can carry a Friday the 13th lucky talisman. Talisman magick goes back infinitesimally in the civilization of humankind, or by some estimates over 4,120 years. A talisman is a small amulet or other object, often bearing magical symbols, worn for protection against evil spirits or the supernatural. There are the interesting talismans that are said to protect us from the evils of Friday the 13th. An 1896 Illinois newspaper article reports on the sale of rabbits’ feet decorated in gold to help ward off the “voodoo of Friday the 13th.” Another form of talisman is the magic square. A magic square is a 4 x 4 square with the sum of each of 4 rows, 4 columns and 2 diagonals always the same, "magic" total. They are found in a number of cultures, including Egypt and India, engraved on stone or metal and worn as talismans, the belief being that magic squares have astrological and divinatory qualities, their usage ensuring longevity and prevention of diseases. Bonne chance and good luck on Friday the 13th, wherever you are! Guiley, R.E. (1999). The Encyclopedia of witches and witchcraft. New York: Checkmark Books. *The above article is excerpted from Hoodoo Almanac 2014-2015. Get your spiritual supplies delivered to your front door whenever you need them! Yes, my grandmother would tell me to stay indoors when friday the 13th came about yet i was born on the 13th and every now and then my birthday comes around that time. So i see it as a day of luck.